With NCAA Football National Letter of Intent Signing Day less than a week away, the University of Illinois Division of Intercollegiate Athletics announces its continued extensive coverage of the day's events on FightingIllini.com. Fans will get an inside look at Illinois' "recruiting headquarters" on Wednesday, Feb. 1, beginning at 7 a.m. CT. Find out the minute a NLI arrives on the signing day live blog, ask head coach Tim Beckman questions during a live chat and watch live video of Beckman's press conference and the signing day event at Assembly Hall. In addition, exclusive behind-the-scenes photos and videos will be posted throughout the day. LIVE BLOG: The events will start with an interactive blog that accounts the day's happenings beginning at 7 a.m. CT. Sports Information Director Kent Brown and assistant SIDs Derek Neal and Ben Taylor will provide all the news from within the football offices as well as up-to-the-minute details of incoming letters of intent from the Class of 2012. This year's blog format will allow the readers to ask questions and make comments simultaneously with the postings. CHAT: Fans will have an opportunity to talk directly with Illini head coach Tim Beckman during his online chat scheduled for 10 a.m. Questions can be submitted in advance. VIDEOS: A number of exclusive videos will be posted throughout the day at FightingIllini.com and CoachBeckman.com. A video spotlighting each signee will be posted as the NLI arrives at the football office, a feature on the new coordinators will be posted a noon and highlights of the hectic morning of signing day from inside the recruiting headquarters will be posted at 2 p.m.
PRESS CONFERENCE: Coach Beckman's press conference announcement of the Class of 2012 will take place at 3:30 p.m. in the Memorial Stadium press box. Free live video will be available at FightingIllini.com, along with photos, biographies and video highlights of all the members of the Class of 2012. 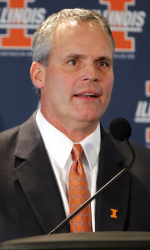 PUBLIC SIGNING DAY EVENT: Coach Beckman and his staff will host an event open to the public to announce the 2012 recruiting class at 4:30 p.m. at Assembly Hall. The coaching staff will greet fans as they enter Assembly Hall starting at 4:30, before introducing the entire recruiting class using the Assembly Hall video board at 5:30 p.m. The event is free and open to the public. Noon VIDEO: "Meet the Coordinators"
2 pm VIDEO "Look Inside Recruiting Headquarters"